Lubbock Westerners workout during Day 2 of camp. would get used to it. But the scramble is still real, no matter how many years you have been doing this! 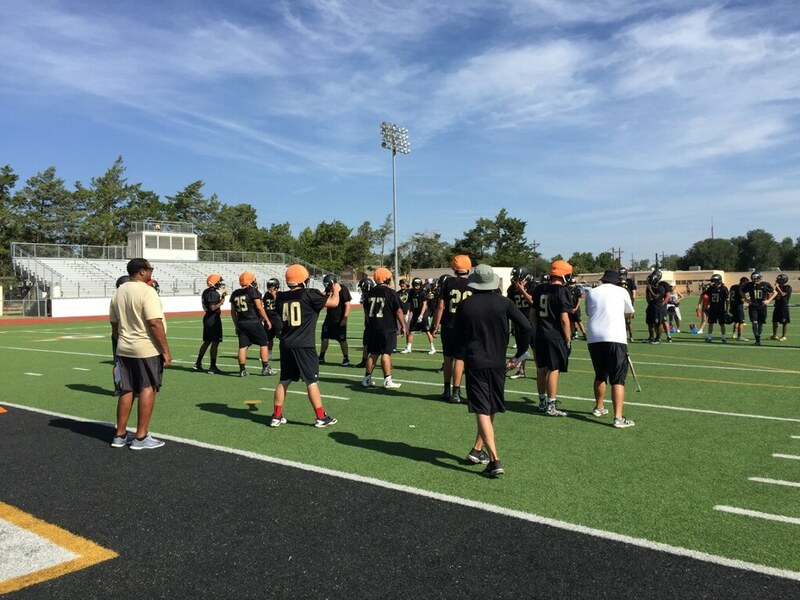 Day 2 of fall camp at Lubbock High School football in west Texas. Once we got on the field yesterday we shook the rust off and went at it. We preached high energy and effort and the Westerners followed through on that end. Overall, it was a great way to start the season. We are now locked and loaded into our routine. Not often will you see a program move their returning three year starter at QB to RB. But, in Westerner Land, this is what we are doing. Dae Dae Morgan will now shift to RB, where he can tote the ball and provide some “trickeration” from the RB spot. If you know me, you know I’m going to throw the kitchen sink at you. I’m excited about the possibilities here! We have a deep backfield. Kwammi Wilborn and Will Austell will take the QB reps in camp. I’m confident these guys will get the job done at QB to allow this shift in position to work. Great leaders who work extremely hard. 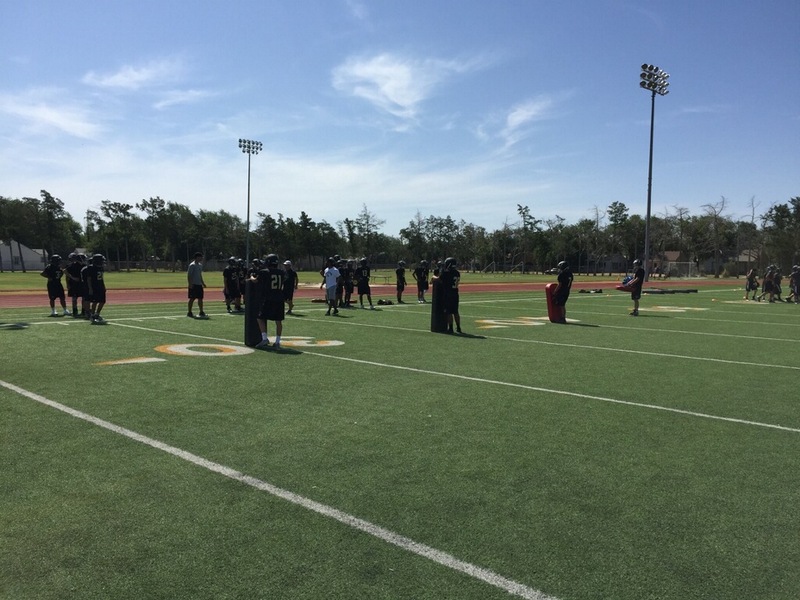 Lubbock Westerners working-out during Day 2 of fall camp. on their toes and break things up. They enjoy defeating my challenges. We added some coaches to the staff this year. It has been refreshing and reinvigorating. New faces, new blood and a new attitude. We just had two great days of practice. These guys are bringing the energy. Lance Hogle was brought in to coach the WR’s. He is a veteran west Texas coach and has prior head coaching experience…Energy…Enthusiasm…Knowledge. Great traits! Nathan Slaughter, a former LHS standout, was also brought in to coach the WR’s. He has been terrific. Bright, young football mind. His NFL and CFL experience are a great asset to the program. Jose Morales is our new LB coach. The guy coaches to the whistle every rep of every drill. He is constantly coaching his guys. It is a pleasure watching him work! Under no circumstance should a coach ever allow his job define who he is. It sounds simple but it is very easy to get caught up in the many webs your brain weaves. You are a coach. Your win loss-record does not make you a better man or lesser a human being. It’s just the result of the game we coach. You still get to go home at night and see your family, your kids and even your dogs. Those people don’t care if you just lost a game. They are just happy to see you, the husband and dad you are. Keep things in perspective. Keep your mind right, win or lose. Your job does not define you. Remember, there are many coaches who won state titles, but really haven’t demonstrated they know how to win in the game that matters: LIFE! -Looks like A-Rod may be done as a Yankee. Honestly, it does sadden me. -Reiteration of the day: Coaches have their own likes, interests and opinions. It does not mean we do not care about other sports on our campus. I cannot stand watching the NFL. It’s annoying. Does that mean I don’t like my own football team? Please! Common sense Apply it here. -Pokemon Go is arguably the most annoying trend in the last 40 years. It’s up there with the crying Jordan face. -I read that college coaches can now retweet and like recruits tweets… Say what? This is a sad state of affairs…on many levels. It’s just a weird world we live in. -Assistant coach Tyler Trout is a huge Cubs fan. Therefore, he will jinx their World Series chances this year. -Loyalty is a forgotten trait. We need to make it important again. Twitter or in grocery stores aren’t running for top office. I wonder why… Oh wait. That’s right. You aren’t qualified. Moving on, experts. We will talk Day 3 tomorrow. Should be fun! FIO in the mean time!